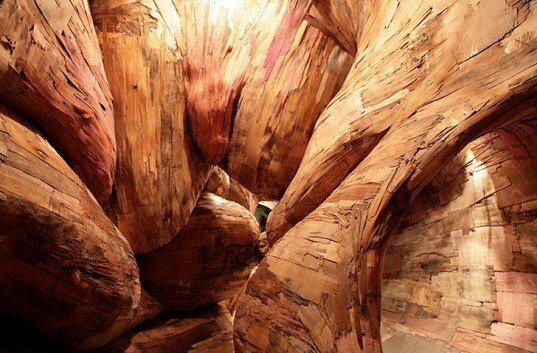 Brazilian artist Henrique Oliveira’s powerful recycled wood installations snake through their exhibition spaces like massive living trees that burst out of walls and ceilings. Oliveira scours the streets of Sao Paulo to gather weathered plywood, which he then separates into layers and combines to create his massive “tridimensionals” sculptures. The stunning mixed media pieces are a combination of sculpture, painting and architecture - read on for a closer look! Initially a painter, Oliveira was inspired by an old wooden fence he saw through his window across the street from his studio in Sao Paulo. The wood was so weathered that it split into layers, which Oliveira equated to brush strokes. From that day, the artist began collecting old weathered fences from construction sites and transforming them into his inspiring ‘tridimensionals’. He peels the weathered layers off of the fences as they decay, collecting slivers of different colors, shapes and sizes. The plywood fences are quite common in the city of Sao Paulo, which Oliveira says is consistently under construction. Construction companies use the plywood because it is inexpensive, and they replace it every few months when the elements break it down. 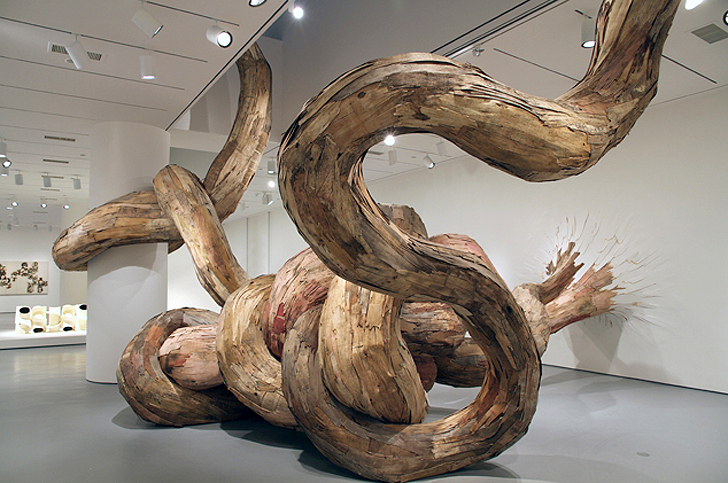 Rather than letting the damaged fences go to waste, Oliveira peels off layers of wood and uses the pieces as ‘brush strokes’ to form his large-scale installations. As he secures each strip, the layers build up and create organic curves and coils that burst out of walls and wind through space in amorphous forms. From afar, they can appear to be soft and smooth, but a closer look will find a series of raw edges that guarantee a splinter upon the touch. Oliveira has created an eco-friendly body of work using a unique process and style which treats discarded wood as if it were strokes of paint. Seeing the beauty in the damaged, he gives worn pieces of wood new life. . Initially a painter, Oliveira was inspired by an old wooden fence he saw through his window across the street from his studio in Sao Paulo. The wood was so weathered that it split into layers, which Oliveira equated to brush strokes. From that day, the artist began collecting old weathered fences from construction sites and transforming them into his inspiring 'tridimensionals'. He peels the weathered layers off of the fences as they decay, collecting slivers of different colors, shapes and sizes. Rather than letting the damaged fences go to waste, Oliveira peels off layers of wood and uses the pieces as 'brush strokes' to form his large-scale installations. As he secures each strip, the layers build up and create organic curves and coils that burst through gallery walls and wind through space in amorphous forms. From afar, they can appear to be soft and smooth, but a closer look will find a series of raw edges that guarantee a splinter upon the touch.